“Traveling to Palmyra this week was a great break from Damascus and a welcome refresher on the amazing history of the region. Although this time we had the same driver (Abu Adnan) in Palmyra, nothing else was the same. It was hot dusty and dry, and the tourism industry of the place was suffering hugely. 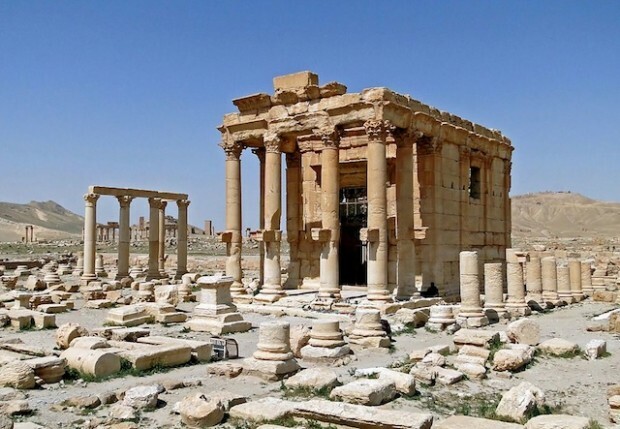 The hotel we stayed in (Tetraplyon) was completely empty and the ruins of Palmyra were host to only 20 or so tourists.” – diary entry for the 24th April 2011, Palmyra, Syria. Tears fell for Palmyra this week as ISIS beheaded its long-time curator Khaled al-Asaad and destroyed one of its most famous Roman-era monuments. The rose-coloured stone – which romanced so many visitors – has been obliterated. The world owes a debt to all who have died in defence of Syria and Iraq’s heritage. Those tears were for them, for the lost treasures of our collective past and for the future of the region. Tony Abbot will use the heartbreaking news from Palmyra to justify expanding Australia’s ISIS bombing campaign into Syria. Yet those grieving over the destruction of the region’s heritage are asking what exactly this campaign is targeting or achieving? In an estimated 6000 bombing runs against ISIS targets since August 2014, the U.S-led coalition seems to have accomplished little. The coalition proved its capacity to collect detailed intelligence on ISIS in the targeted killing of an upper level ex-Ba’athist military planner in Syria earlier this year. Yet their failure to foresee or hamper ISIS simultaneous advances into Ramadi and Palmyra earlier this year was telling. 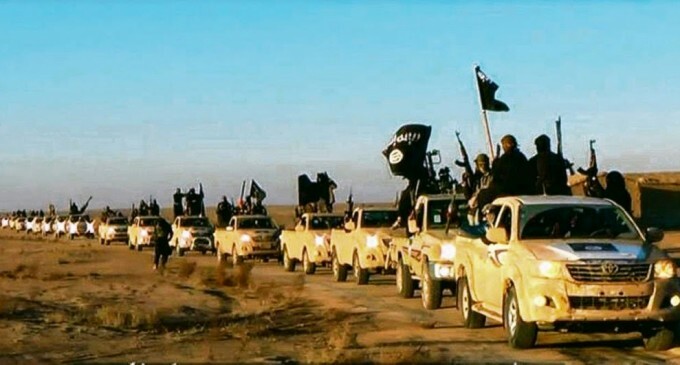 Why did they do nothing in response to columns of heavily armed ISIS militants rolling through flat desert towards both major towns? U.S military sources tried to blame the weather, saying that the most advanced military in the world could do nothing because there was dust in the air over Ramadi that morning. No explanation has emerged regarding Palmyra. Some have tried to explain the ‘moderate’ pace of the campaign against ISIS as being deliberate and in accordance with the language used. Degrade and destroy we are told, is a military description of a long-term strategy of chipping away at a force’s capacity. Yet why a ‘slow and steady’ strategy was chosen has never been explained. Even more incredible is the lack of pressure the US has put on Turkey and its Gulf allies to do anything about ISIS or the extremist groups they actually support. The meek campaign against ISIS is not an anomaly in the love-hate relations between western powers and the extremist opposition militia in Syria. Recent months have seen an escalation in attempts to present Jabhat an-Nusra (al-Qaeda in Syria) and Ahrar as-Sham as acceptable ‘moderate Islamist’ opposition to the secular Syrian government. Al Jazeera and the Washington Post have both hosted fireside chats with the groups’ leaders, welcoming their promises to not behead anyone without a beard. Both groups also receive support (training and weapons) from Turkish, U.S, British, Jordanian and Israeli forces in the northern and southern fronts in Syria. Yet the concrete difference between ISIS and Jabhat an-Nusra or Ahrar as-Sham is next to none. They are competitors who favor different styles of propaganda. ISIS plays the hardliner while through ‘moderation’ Jabhat al-Nusra can now carry out summary executions while a U.K – influenced NGO stands by. The purely political decision to involve Australia militarily in another war-torn country of the Middle East will simply risk further entanglement in the region. The lack of informed political opposition to such a move is telling of Australian leaders’ ignorance to the broader implications of what is taking place in the region. The only response has come from the leader of the Australian Greens, who seems to suggest Australia should also be targeting the Syrian Government. In the meantime we are lending an unnecessary hand in the disjointed ‘have your revolution and fight terror too’ strategy of the West, the Gulf and Turkey, which is tearing its way through the region’s infrastructure, history, culture and identity.